Journey from the everyday to the exotic with this alphabet on the move. Cross the B-shaped arches of a bridge; land on the angled L of an airfield; drive over the looped O of an overpass. Bill Mayer's bold art evokes classic travel posters with utterly modern color and flair. Allow your imagination to soar -- and discover something unexpected in each elegant picture puzzle. 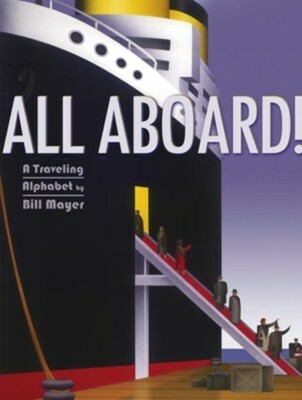 Bill Mayer's work has appeared in major journal publications such as the New York Times magazine, National Geographic, Time magazine, Sports Illustrated, and the Wall Street Journal. He also created the Bright Eyes stamp series for the U.S. Postal Service, and has illustrated picture books such as All Aboard by Chris Demarest. Bill lives with his wife, a fellow artist, in Decatur, Georgia. For more information, visit him at thebillmayer.com. I'm the author/artist and I want to review All Aboard! : A Traveling Alphabet.